Other Dates Available. Charter Trips Available. *Highwater dates, please call our office for more information. This proposed Wild and Scenic River is totally isolated from modern civilization: a canyon of serene solitude surrounded by red sandstone spires. National Geographic joined us in Westwater Canyon to photograph and write of the dramatic scenery and its unique wildlife habitat. The river cascades through the ever-deepening sandstone monuments and into the narrow Black Granite Gorge. 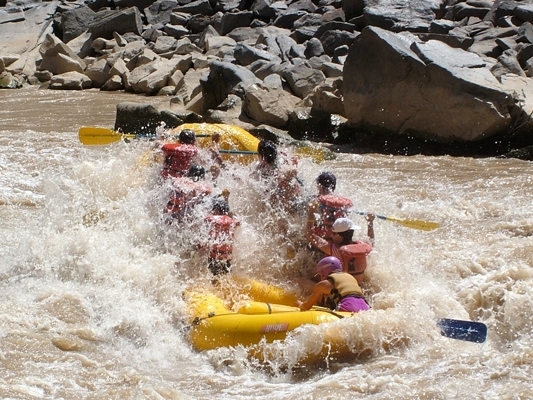 Here the river meets opposition from the canyon walls, creating the fast and furious rapids that give Westwater Canyon its reputation: Funnel Falls, Last Chance, the Steps, and, of course, the infamous Skull Rapid. 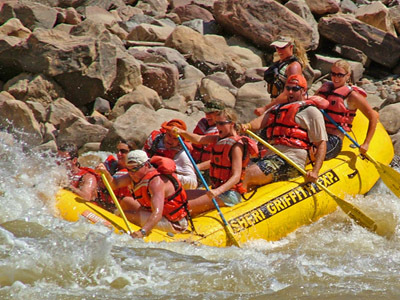 This trip is designed for adventure seekers and canyon lovers, for those looking for great rapids on a remote and regulated river. The small number of people allowed in this canyon each day is strictly controlled. 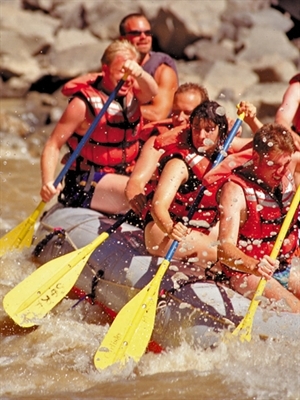 That means you will encounter almost no one else on the river during your trip. 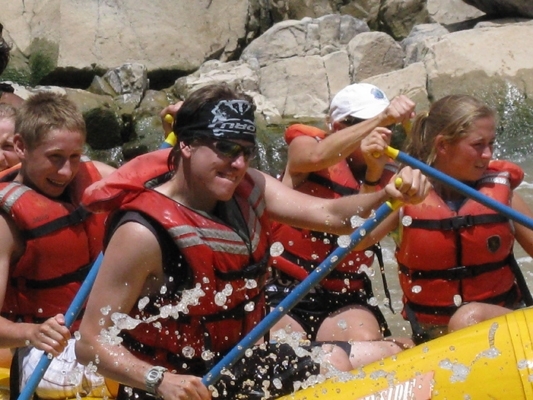 We use oarboats here, but paddleboats are available for the adventurous. 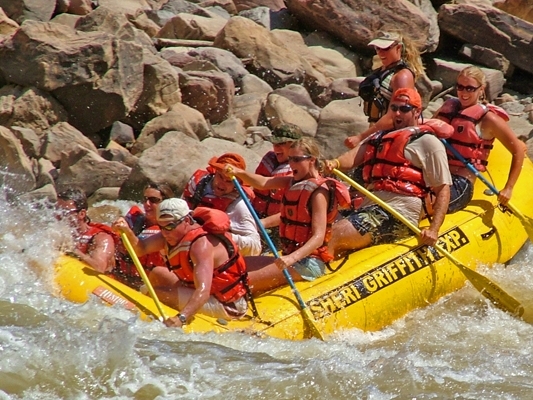 An oarboat is an 18 foot inflatable raft maneuvered by a guide with a set of oars secured in the middle of the raft. A paddleboat is a 16 foot inflatable raft manned by passengers and their paddles, with the guide navigating from the back of the raft. 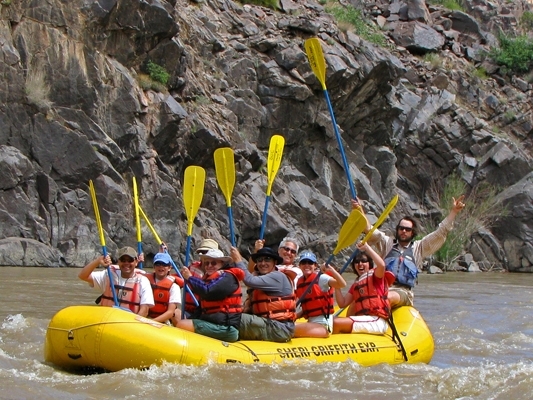 There will be chance to swim and enjoy the river as you float out of Westwater Canyon. The ride back to Moab will be filled with stories of the hole in 'Sock-It-To-Me' and the beautiful sunset the night before. The van returns you to Moab around 5-5:30 PM (MDT)**. **The return time is approximate, and may change due to water levels, weather conditions or other factors. 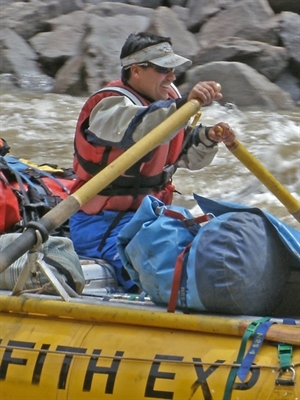 Guide Gratuities by no means required but always appreciated by our guides. 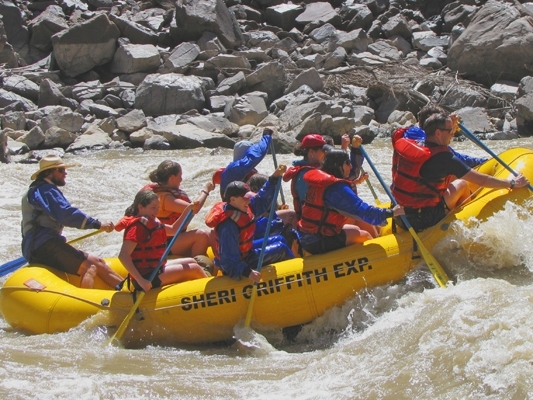 We recommend 15-20% of the cost of the river portion of the trip. solitude surrounded by red sandstone spires. National Geographic joined us in Westwater Canyon to photograph and write of the dramatic scenery and its unique wildlife habitat. The river cascades through the ever-deepening sandstone monuments and into the narrow Black Granite Gorge. 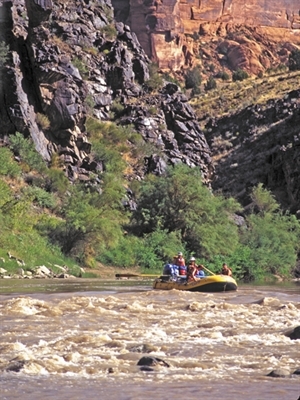 Here the river meets opposition from the canyon walls, creating the fast and furious rapids that give Westwater its reputation: Funnel Falls, Last Chance, the Steps, and, of course, the infamous Skull Rapid. 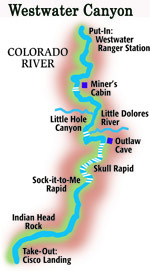 7:15-7:20 AM--Depart for Westwater Canyon. 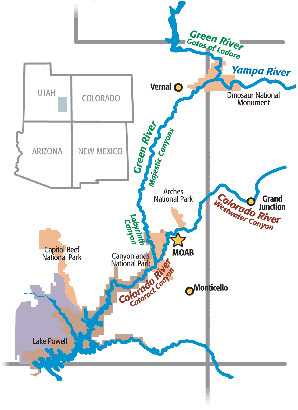 There is a two hour drive from Moab to the Westwater Ranger Station, where we will start our river journey. 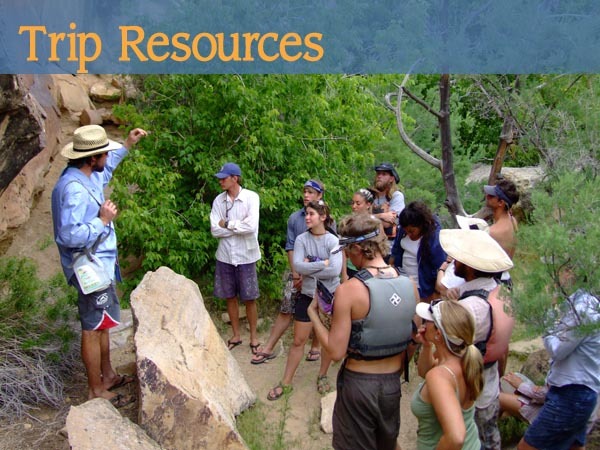 9:15-9:30--We will arrive at the Westwater Ranger Station, where we will put on and size the PFDs (Personal Floatation Devices). We will have a brief safety discussion and then board the boats and start our journey. Mid-day--We will stop for a "Build Your Own" Sandwich Buffet lunch at one of the beaches along the river. After lunch, the guides will re-check the PFDs, and one guide will go over important safety details that will help keep everyone safe as we traverse the whitewater. 3:00 PM**--Arrive at the Cisco boat ramp. The guides begin to secure and load the rafts onto the trailers. 3:30 PM**--Depart Cisco as we return to Moab. The drive from Cisco to Moab takes approximately one and a half hours. 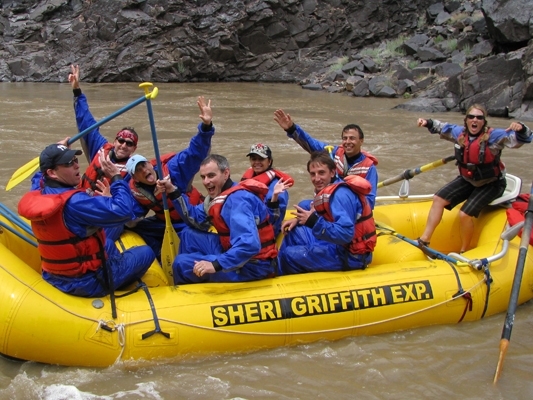 5:00 PM**--Arrive at the Sheri Griffith Expeditions office in Moab. **The take-out and return times are approximate. Water Conditions, weather and other factors may lead to a later or earlier return time. PLEASE MEET us dressed for the river: in swimsuit, shorts, T-shirt, shoes that can get wet, hat or visor, sunglasses, etc. Please bring a water bottle. Bring a sweatshirt or sweater, rain gear, sunscreen, a change of dry clothes and any additional beverages that you want. (We’ll provide iced coolers for your aluminum cans and plastic bottles.) Any items that need to be kept dry, like a camera, film, prescriptions and such will be put in a watertight bag or box at the launch site. ADVANCE RESERVATIONS ARE REQUIRED.